The following story was submitted to NACCHO’s Stories from the Field website by Jeanne Garbarino from Vineland City (NJ) Health Department on Sept. 17. NACCHO’s Stories from the Field website provides a means for local health departments (LHDs) to share their experiences and demonstrate the value of public health. Stories from the Field can be used to support advocacy, peer learning, and collaboration with state and federal partners. Share your story at http://nacchostories.org. When the Vineland City Health Department (VCHD) in Vineland, NJ, discovered that a lack of education around proper hand washing was the number one public health offense in the city’s retail food establishments, local health department (LHD) and Food Safety Council staff thought up an unusual solution: let students do the teaching. Through a contest with cash prizes, the department tasked K-12 students to contribute drawings illustrating best practices related to hand washing; the winning art was then published in the VCHD’s inaugural “Serving Safe Food Calendar,” distributed to every retail food establishment in the city. The calendar project began in 2005, after the VCHD conducted its first risk-factor study with the U.S. Food and Drug Administration’s voluntary standards program and identified poor personal hygiene as the biggest health issue present in the city’s restaurants. A lack of hand washing spreads the viruses and bacteria that can lead to a number of foodborne illnesses, such as norovirus and salmonella. The LHD wanted to combat this issue in a creative, original way in hopes of gaining more attention from the food service community, and raising a higher level of awareness surrounding hygiene issues. Along with the Food Safety Council, the VCHD began brainstorming education campaigns and someone suggested enlisting local students to draw posters; the idea quickly evolved into a calendar. The original production focused only on hand washing, but in subsequent years, the VCHD has expanded its focus to also cover proper food temperatures and foodborne illnesses. It isn’t a regular series – in total, the project costs about $4,000, so the department only produces them when funds are available – but when the opportunity arises students, parents, teachers and food service industry workers jump at the chance to take part, whether that means contributing a drawing or just pinning a calendar on a wall. Calendars have since been produced in 2009, 2011, 2012, and 2014. Artwork is selected through a contest that offers 12 winners a $50 Visa gift card and the opportunity to receive their prize during a televised city council meeting. Surprisingly, it’s the brief TV appearance that really drives kids to participate, and not the cash. To garner enough submissions, the VCHD reached out to local teachers – a challenge in itself, as catching teachers when they weren’t busy was not always achievable – and asked that they promote the contest to their students. 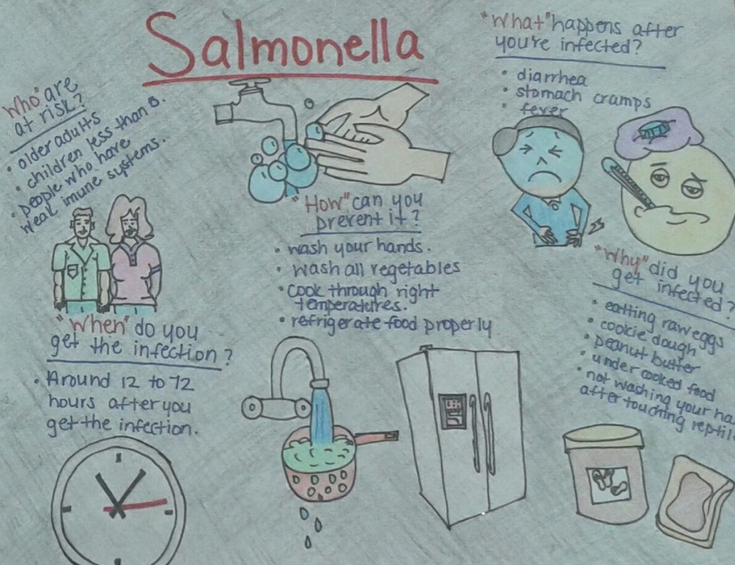 Some biology teachers even turned contest participation into a graded classroom assignment; they studied the various foodborne illness that can arise due to improper hand washing or refrigeration and students incorporated their lessons into their drawings. Simple outreach efforts expanded the scope of the VCHD’s original project; students and teachers were able to engage with public health education in a more meaningful way, and came away from the project with a strong personal understanding of the issues. Once published, every licensed retail food establishment in the city, from top-tier restaurants to coffee carts, receives a copy of the calendar. The VCHD even provides them to the supermarket departments that handle and prepare raw foods. And though there are no established, direct links between calendar production and changed habits, risk factor studies conducted in the nine years since the project began have shown an improvement in personal hygiene practices among the city’s food service professionals. Additionally, VCHD staff have heard anecdotal evidence about community members whose children have taken to monitoring their family’s hand washing habits, or contest winners who now manage restaurants. And, perhaps most poignantly, retail food establishments sing the praises of the calendars and greatly appreciate the educational opportunity they provide. Despite the clear successes, the calendar project has not been without struggles. Every new production cycle the VCHD undertook illuminated new strategies they needed to follow in order to ensure a useful product. For instance, one of the biggest challenges was timing their initial outreach campaign with a break in teachers’ schedules. If teachers were too busy to deviate from their planned curriculum, the calendars didn’t receive the classroom promotion the VCHD relied on for success. The department has since identified May as the best month to solicit artwork from students and teachers. Another important step was ensuring students had quality information to inform their projects. The VCHD found that it was often necessary to provide resources directly to the teachers; as schools do not typically teach food safety, classrooms really relied on the health department to educate them about proper behaviors. Any LHDs interested in replicating Vineland’s calendar project, or initiating their own food safety education campaign, should remember the importance of including the whole community in the process. By involving students in the calendar, the VCHD was able to educate children, parents, and teachers in addition to the food service establishments originally targeted. Food safety became education became the whole city’s mission, not just the health department’s. This entry was posted in environmental health on November 10, 2014 by nacchovoice.